There are many ways for indoor and greenhouse marijuana growers to be sustainable, but few types of grows are more environmentally friendly and inexpensive to run than an outdoor, closed-loop farm. Plants are grown on the farm to be used in nutrient mixes, composts and pest repellents. Excrement from farm animals, say, alpacas are used in compost. Many commercial cannabis growers shy away from such systems, however, figuring they aren’t viable on a commercial scale. To be sure, accumulating enough worm castings and ingredients from your garden for nutrient composts and organic sprays for 1,000 plants sounds daunting. But not only can it be done, it’s simple, said Mark Simpkins, chief cultivator at Sacred Flower Farms, which he started on a former 16-acre pear farm in southern Oregon. 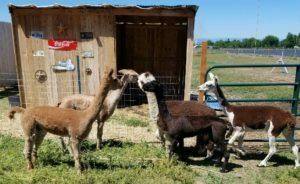 Sacred Flower, for example, gets almost all its ingredients for soil nutrients and pest and contaminant control from a diverse army of plants and flowers, as well as five alpacas. Simpkins grows his marijuana seasonally outdoors, but he said many of the techniques he employs at his Oregon farm can be used indoors or in greenhouses.